The Hungarian Revolution of 1956 or Hungarian Uprising of 1956 was a spontaneous nationwide revolt against the government of the People’s Republic of Hungary and its Soviet-imposed policies, lasting from 23 October until 10 November 1956. It was the first major threat to Soviet control since the USSR’s forces drove out the Nazis at the end of World War II and occupied Eastern Europe. Despite the failure of the uprising, it was highly influential, and came to play a role in the downfall of the Soviet Union decades later. The revolt spread quickly across Hungary and the government collapsed. Thousands organised into militias, battling the State Security Police (ÁVH) and Soviet troops. Pro-Soviet communists and ÁVH members were often executed or imprisoned and former prisoners were released and armed. Radical impromptu workers’ councils wrested municipal control from the ruling Hungarian Working People’s Party and demanded political changes. A new government formally disbanded the ÁVH, declared its intention to withdraw from the Warsaw Pact, and pledged to re-establish free elections. By the end of October 1956 fighting had almost stopped and a sense of normality began to return. After announcing a willingness to negotiate a withdrawal of Soviet forces, the Politburo changed its mind and moved to crush the revolution. On 4 November, a large Soviet force invaded Budapest and other regions of the country. The Hungarian resistance continued until 10 November. Over 2,500 Hungarians and 700 Soviet troops were killed in the conflict, and 200,000 Hungarians fled as refugees. Mass arrests and denunciations continued for months thereafter. By January 1957, the new Soviet-installed government had suppressed all public opposition. These Soviet actions, while strengthening control over Eastern Europe, alienated many Western Marxists. Public discussion about this revolution was suppressed in Hungary for more than 30 years. Since the thaw of the 1980s, it has been a subject of intense study and debate. 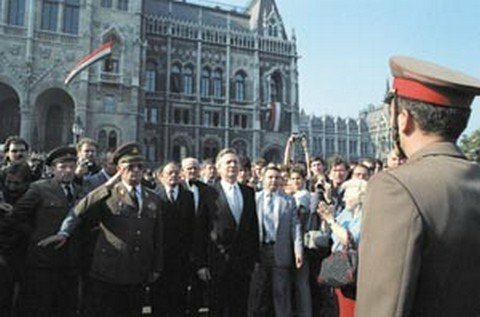 1989 2 At the inauguration of the Third Hungarian Republic in 1989, 23 October was declared a national holiday. In this short video we can see the most important events of Hungary of the last millenniums: an amazing work which highlights the Hungarian history. While watching the video, we can see the beginnings: from the Miracle Stag to the recent events of Hungary. Hungary was under the rule of states and empires which expanded and disappeared around it. The Hungarian nation has survived lots of attacks from different states but has always survived. We can see the devastated happenings, for example the consequences of Word War I. We can also recognize some important persons from the history, as Petőf Sándori, Nagy Imre, etc. Revolutions, fights, World Wars were all affect Hungary and changed its future. This entry was posted on October 24, 2016 by HKW in Uncategorized and tagged Hungarian Revolution 1956, Hungarian Uprising.